This year we decided to hold the competition a little later in the hope that the weather would be better and everyone would be able to enjoy their pints and pies outside with the Elland Silver Youth Band playing in the Bridge Inn car park by the River Calder. It turned out to be quite cold and wet but the band played bravely on. From 12 noon pie makers began to deliver their pies to be judged. Most of the entrants came from West Yorkshire, but there were entries from Lancashire, Nottinghamshire, Hartlepool and Keswick. Mr Michael from Keswick won 4th place last year and this time he came with a bus full of supporters determined to bring back another prize. By 2 pm the judging was ready to begin. All the pies had been numbered by Kevin and the judging teams assembled all dressed up in new tee shirts advertising our Sponsors Taylors Brewery. The wonderful aroma of fresh pies was overwhelming. I was scheduled to judge in the third round and therefore felt safe in eating a pie prior to my official tasting duties. After all if I went into the tasting session ravenous I would be unable to judge effectively. That is my excuse anyway! 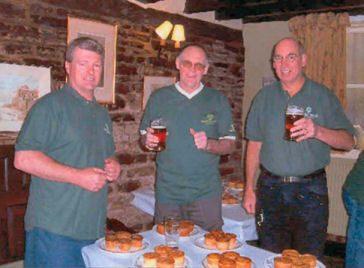 As the judges manfully tackled the challenge of tasting the products of 52 pie makers the old Bridge Inn was full of butchers, bakers and pie enthusiasts eating pie and peas and drinking Websters fine ales served by Tim the owner and landlord of the Bridge Inn and his staff. Tension mounted as the judges wittled down the entrants to 12 for the 3rd and final round. At 4.45 Kevin and Tim retired to total up the scores of the judges. At 5.30 with the Regions Press eagerly awaiting the results were announced. Just a few marks separated the first 4 places. 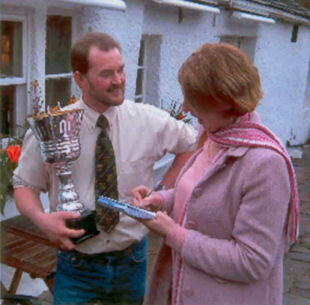 Mr Michael of Keswick just missed a cup this year with 5th place. In 4th place was Hopkins of Bradford, Third place went to Cryers of Halifax. 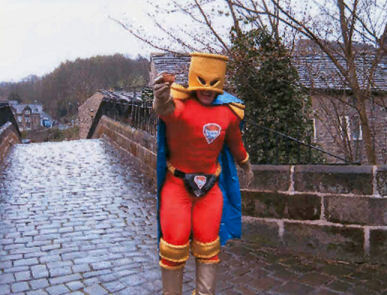 Runner up was Middlemisss of Otley. The winner was Wilsons of Leeds. It was a really great afternoon. The competition was fierce with many outstanding pies. All the entrants were of a very high standard and all deserved to be commended. 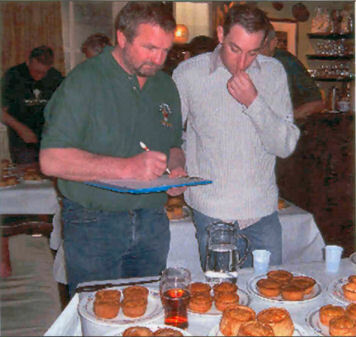 If you have a favorite pie, why not tell your supplier about the competition and they can enter next year and be tested against the best in the Pork Pie Appreciation Society Annual Competition. The sale of extra pies donated by the entrants raised over 1500 pounds donated this year to St Bartholomews Church, Ripponden Restoration Fund.